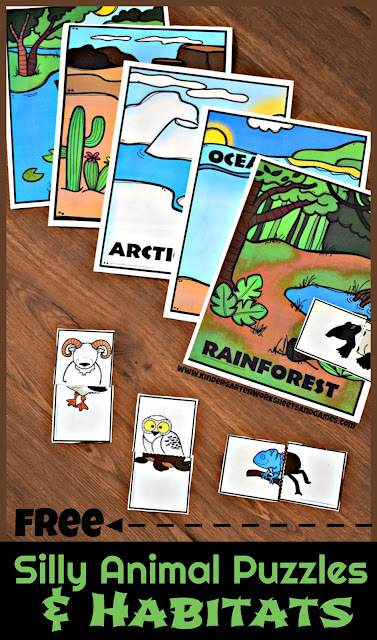 Get ready for giggles as kids creative some zany animals with these free printable silly animal puzzles. Then use this activity to explore where animals actually live with this habitats activity. Then, check out our Kindergarten Science activities for more fun, hands on learning activities. These silly animal puzzles are lots of fun for kids! Kids are going to love mixing and matching animal fronts and backs to create some hilarious new animals. HINT: You can use this as a writing springboard and have children name their new animals and write a story about them. Print the free download on cardstock for durability. Kids will enjoy making different silly animals over and over again so you need them to be durable. You will love how simple these puzzles are. 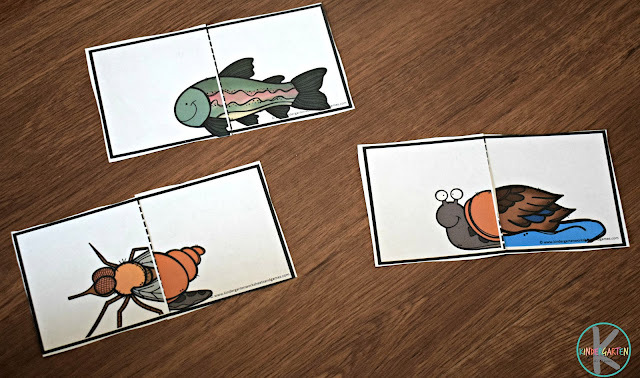 These 2 part puzzles are perfectly aligned so that kids can mix and match any animals – mosquitoes, camels, ducks, fish, snails, snakes, and more. 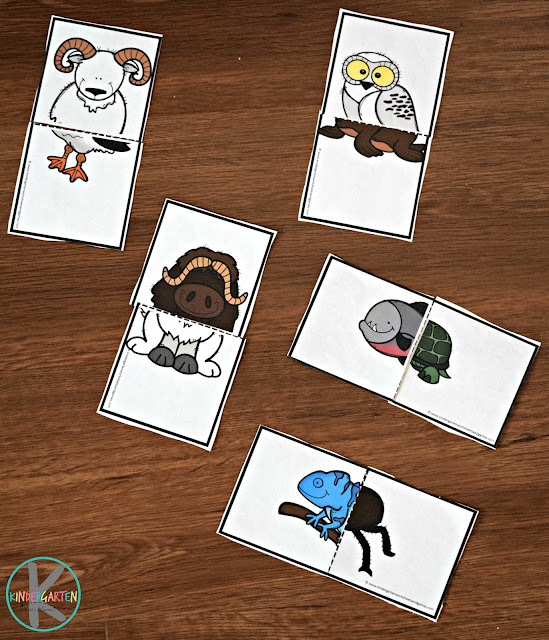 My kids just giggled and giggled at the silly animal puzzles they created like the goat bird and the half chameleon and half spider animals. would the goat bird have trouble swimming with his horns? how would the piranha turtle swim? what about the owl sea lion – would it fly or swim? After the kids enjoyed making some silly animal puzzles, we made the animals the “right way”. Then we worked on figuring out where the animals belonged and sorted them into 5 different habitats. There are six animals for each habitat. If you are unsure of what habitat animals belong in, don’t worry there is an answer key included! Check out books from the library on your favorite animal or habitat. 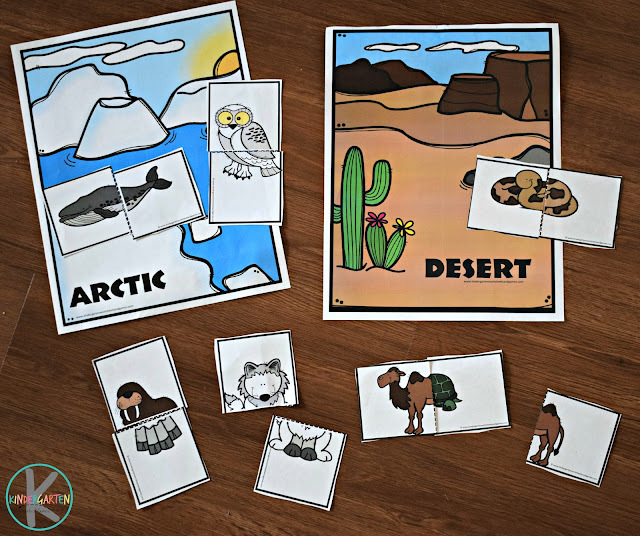 Try this fun, free printable Biomes Board Game that takes you through different habitats while exploring animals more closely.